The AV-49 Wasp is a VTOL aircraft in service with the United Nations Space Command. The AV-49 shares several similarities with its fellow aerodynes, the AV-14 Hornet, AV-19 SkyHawk, AV-22 Sparrowhawk, and AV-30 Kestrel. The aircraft features an integrated VTOL propulsion system that combines dual lift ducted fan engines pioneered by the AV-30, with air-cooled vectored-thrust fusion thrusters for forward movement. The AV-49 also features twin autocannons and rocket launchers, energy shielding, and cyberlink-compatible fly-by-light avionics. Designed for expeditionary usage, the Wasp can be easily prepped and deployed with minimal tools, and their hardened storage containers have identical dimensions to NAVLOGCOM-standard flat containers, simplifying interstellar transport logistics. The AV-49 Wasp supplements existing stocks of AV-14 and AV-22 aircraft in Marine service. The Wasp was developed alongside the STINGER-class Mjolnir, which has two neural interface controllers to allow the operator to switch from flight to ground combat modes at the speed of thought. ONI Wasp: The size and mobility of the AV-49 Wasp makes it a favorite of ONI Security teams in high-threat environments. ONI Wasps are outfitted with heavy armor and upgraded weapons, such as all-environment homing missiles capable of locking on to ground vehicle targets and HEDP (High Explosive Dual Purpose) machine gun rounds. As the dark livery of these particular AV-49 Attack VTOLs imply, ONI Wasps are very often employed during stealth surveillance operations and night-strike sorties. The hushed and rumor-laden nature of this reality has earned both the craft themselves and their respective pilots the nickname "duskdevils". Hannibal Wasp: Misriah Armory and Hannibal Weapon Systems collaborate on initiatives to evolve their existing offerings of weapon systems and vehicles. Perhaps nowhere is this more evident than inside the Hannibal Wasp. This highly-advanced Wasp sports upgraded heavy armor, gauss repeaters, and experimental ion field bomb launchers as well as more speed and evasiveness than the ONI Wasp. 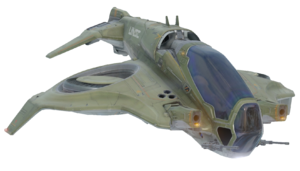 A vehicle called the Wasp was cut from Halo 4 early in development. Whether it had any relation to the AV-49 Wasp is unclear. The cockpit features a handle that rests between the legs of the operator, nearly identical to the ejection seat trigger handles of many modern aircraft. Concept art for the Hannibal Wasp. Concept art of the Wasp for Halo 5: Guardians. A close-up of the Wasp on Attack on Sanctum. A Wasp firing upon a Kig-Yar Sniper on Attack on Sanctum. Two Wasps and a Type-54 Banshee in Warzone Firefight. The energy shielding on a Wasp. A trio of Wasps in Warzone. REQ Card of the Wasp. HUD of the ONI Wasp. HUD of the Hannibal Wasp. An ONI Wasp, Hannibal Wasp, and Wasp (from left to right) on Battle of Noctus. View inside the cockpit of a damaged ONI Wasp.